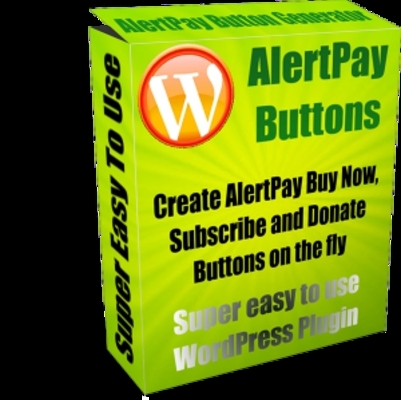 Alertpay Button Generator Plugin for WordPressSuper easy to use WordPress plugin Anyone can create payment buttons. The plugin was easy to install simply upload and activate from the wordpress panel (about 20 seconds). Then I clicked on the settings, I found it really easy to set up, even a child could do it. Simply select the Thankyou/Download page, select the price, etc and hit save. I then made a test post and added the simple line of code to the post message and bingo, I read back the post and there was the nice looking AlertPay button. I tested it and it went straight to my alert pay account, the price was correct and everything. All in all it took me less than 5 minutes to set up, and thats including writing the post! I think this plugin will open up a whole new world for Internet Marketers, especially those involved in MLM who tend to use AlertPay because some other online payment processors dont allow it. A minisite ready for you to accept orders and start making money immediatly! * Both include simple to setup PayPal and AlertPay buy now buttons simply edit in your account email. [Yes] Can be uploaded to https://www.tradebit.com or other Plugin Repositories.